Punctuality. It’s a simple old thing, and yet, we all have at least one friend who would be late to the scene of their own death, and forget to show up for their own funeral. (Needless to say, if you don’t have that one friend, you probably are that one friend, and should be thoroughly ashamed of yourself). Alas, for me, it’s not just one friend who is always catastrophically late, but rather, most of them, and all the tactics I have learnt over the years no longer seem to work. Take for example, the catch-up dinner I organised a few weeks ago at Elephant Royale – a popular Thai restaurant that was local and easy to get to for everyone involved. Having made an intentionally early reservation of 6:30pm, I was certain that on this occasion, we would all manage to get home in relatively good time. No sooner than I had walked into the restaurant at 6:25pm, did the dreaded messages begin to flood in – “Running late”, “Will be there at 7”, “Wait, we need to get there before 7?”. With an exasperated sigh, I took a seat with my more punctual comrades, sharpened a butter knife, and awaited their arrival. Having written a novel, developed osteoporosis, and devised a solution to global conflict, we decided that we had waited long enough, and promptly placed an order for our starters. I opted for a plate of “stuffed chicken wings”, which, as the name would suggest, was composed of individual chicken wings wrapped with glass noodles and bamboo shoots, all encased within a deep-fried honey breadcrumb coat. The sweet and crisp casing of each piece broke away to reveal a juicy and tender chicken wing within, but of the three wings on hand, only one contained a noticeable stuffing of noodles and bamboo shoots. Nonetheless, the textural contrast was rather enjoyable, and the accompanying sweet chilli sauce served as a pleasant complement. As I brushed off the crumbs, the final latecomers straggled in at 8pm to face my wrath. 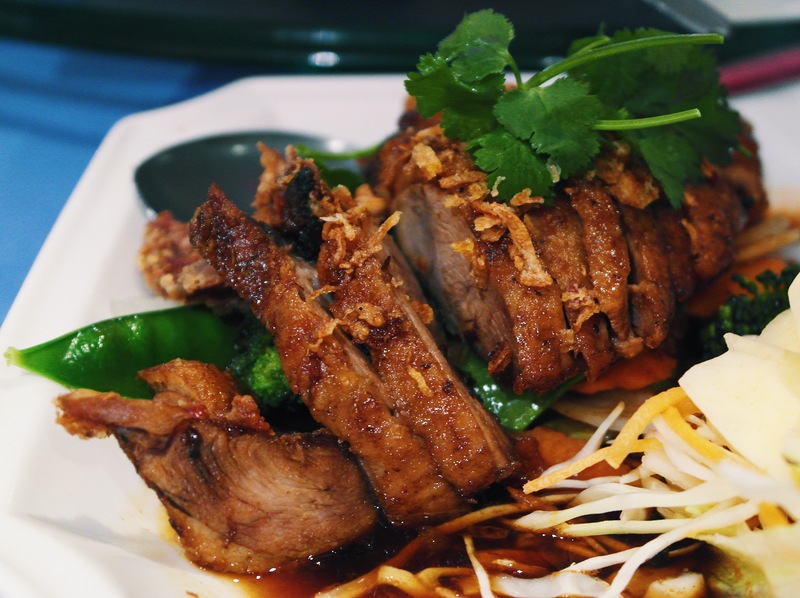 After only just managing to convince me that a death penalty would be a little excessive, I spared their lives and proceeded to order a Ped Makham – grilled duck on a bed of fried spinach and tamarind sauce, with a side of vermicelli noodles. The thick slices of duck possessed a delicious, crispy skin, which led the way into a tender, albeit, occasionally dry centre. Fortunately, the underlying tamarind sauce managed to resuscitate the lost moisture within the duck, and coated each slice with a sharp and sweet tang. This worked rather well with my unconventional pairing of vermicelli noodles, which were soft, flavourful, and riddled with crunchy beansprouts and spring onions. Napolean meanwhile, had ordered a Khao Pad Sapparod (pineapple-rice), which was composed of fragrant jasmine rice, juicy, tender shrimps, crunchy cashew nuts, shreds of soft fried egg, and sweet diced pineapple. Here, the assortment of textures and the balanced combination of sweet, sour, and savoury ensured that it was a faithful execution of a popular traditional dish. Overall, our bill amounted to approximately £210 for seven people (or £30 each). Starters come in at a rather costly range of £8 to £12, whilst most main dishes cost between £10 to £15, and sides around £5 to £7. Whilst the food is by all means satisfying, prices do seem to be ever so slightly inflated – particularly in comparison to similar Thai establishments within the East-End. That said, it is unlikely that you will feel wholly unsatisfied, or completely out of pocket at the end of your meal. Particular credit must be given to the courteous waiters and waitresses who make up Elephant Royale’s team, who waited rather patiently for the arrival of our despicably late friends. Service remained efficient and attentive throughout the night, and no aspect could be faulted. As is the case with many Thai restaurants, Elephant Royale carries an intricate decor that desperately tries to transport you to Thailand itself. Unfortunately, the blistering cold and drizzling rain quickly obliterates any sense of illusion that try to create, but the effort is certainly commendable. The restaurant can be found a short walk away from Gants Hill station, and parking is available in a car park behind the restaurant – (accessed through Gaysham Avenue). With a faithful and satisfying offering of traditional Thai cuisine, Elephant Royale is one Thai establishment that is well worth considering. Whilst it is certainly not a high-flying eatery that is flawless in every regard, it is an attractive and authentic local restaurant, and one that should do reasonably well to satisfy your Thai cravings. Halal status: The chicken, lamb and duck are halal. Pork and alcohol are served on the premises.